“Bullets ripped the dirt up all round me but none of them were marked Black Jack.” — George ‘Black Jack’ Vowel. Jacqueline Larson Carmichael had two grandfathers who served with the Canadian Expeditionary Force on the Western Front. In 2016, she traveled to Belgium, France and Germany, and walked portions of the Western Front where both her grandfathers were soldiers for most of the duration of World War I.
Carmichael’s curiosity about her grandfathers, George “Black Jack” Vowel, an American-Canadian, and Charles W.C. Chapman, led her to afford Black Jack a Twitter account of his own, @blackjackvowel and #albertaWWIsoldier. 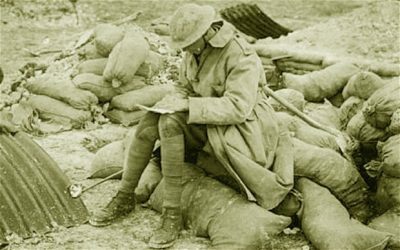 Around Remembrance Day she posted in his name on Twitter and Facebook – as if he were posting from the trenches of Flanders, Belgium and France. Increasingly she was able to gather details of what it was like to serve as a soldier in the Allied Forces during World War I. Released during the 100th anniversary of the final hundred days of the First World War, her compendium incongruously called Tweets from the Trenches: Little True Stories of Life & Death on the Western Front provides 100 stories from the Great War mostly culled from journals and letters and memoirs of Allied soldiers. It highlights everything from rationed rum to homing pigeons to post-traumatic stress disorder. Carmichael uses a timeline as chapter headings to help orient the stories year by year. She incoroprates poetry, prose, footnotes, WWI-era photos, postcards and other documents arising from the Great War. Carmichael is a Port Alberni journalist whose work has appeared in The Dallas Morning News, Toronto Sun, Entrepreneur Magazine and the Westerly News (where she was the publisher). 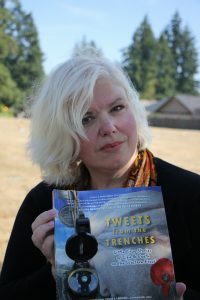 Tweets from the Trenches: Little True Stories of Life & Death on the Western Front is available on Amazon as well as at select bookstores.